If you need any sign as to how popular Blackberry smoke are these days in the UK, the fact they’re playing two consecutive nights at Shepherds Bush Empire should give you an answer. Sadly transport delays meant I got there just in time to hear the last couple of minutes of support act Quaker city night hawks. The little bit I heard sounded good, so I’ll have to keep an eye out for when they tour here next. 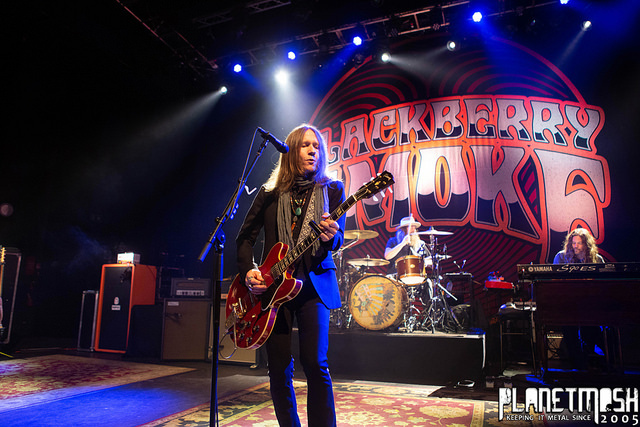 Blackberry Smoke took to the stage and kicked off proceedings with “Nobody gives a damn” from their latest album, “Find a light”. It’s the start of a night of great laid-back country rock. Southern Rock seems to be big at the moment but Blackberry Smoke while appealing to many of the same fans, do stand out as different with their music having Country roots. At one point singer Charlie Starr told the audience that they knew some people would be coming to the second night in London and added…”We might not play any of these songs tomorrow”. He wasn’t joking either – by all reports, they played an almost completely different set the next night with only a handful of songs played both nights. You’ve got to admire a band that can do that – mix things up on tour rather than sticking to an identical setlist every night. I think it adds back some of that element of mystery that we used to have in the days before sites like setlist.fm and facebook let fans see what the setlist has been from previour dates on a tour, and meant that fans often know what the setlist will be before they even arrive at the venue. With Blackberry Smoke though the setlist is still a mystery, and that’s nice. Wow, what a superb show – it feels laid back and there are so many great songs that you can’t help but enjoy it. It was nice to see them doing a few little covers mixed in to their songs. Rather than doing straight cover versions they’d start one of their songs and part way through it moved into a cover and then back to their song. So we got some “Come Together” (The Beatles), “Dirty old town” (Ewan Macoll) and “Jessica” (Allman brothers). In fact the only standalone cover was Fleetwood Mac’s “Oh well”. It really is a great performance – in fact the only disappointment I had all night was when I realised I wasn’t going to be there to watch the second London show. A great night of music. JUNKYARD Bring Their ‘High Water’ Tour to the UK!